Sit back and enjoy the ride with a watercraft built for serious comfort and priced to save you more coin. Experience a smooth ride on any body of water, and thanks to its manually adjustable suspension, those long days of cruising just got even more comfortable. 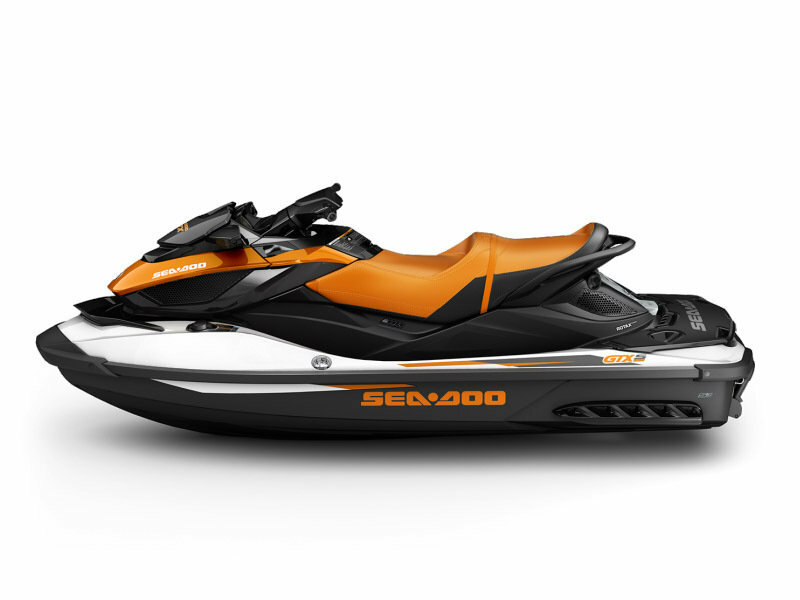 Continue reading for more information on the Sea-Doo GTX S 155. Enjoy the added comfort of a manually adjustable suspension. Enjoy a smooth ride in almost any water condition on this large, luxurious ride. And thanks to its legendary S³ Hull, you’ll stay glued to the water and enjoy reduced drag for all around better handling. The S³ Hull has a stepped design that reduces drag while staying glued to the water, for a stable and consistent ride that also improves fuel efficiency. It’s also incredibly strong, thanks to its ribbed construction. This means you get better handling. Choose from different riding styles with the touch of a button. Adjust the nose angle of the watercraft higher (stability at high speeds) or lower (for towing and quick starts). You can quickly access the Variable Trim System (VTS) on the handlebar for fine-tuned handling based on rider preference, water conditions, and number of passengers. Each Sea-Doo watercraft comes equipped with a legendary Rotax 4-TEC engine, specifically designed for marine use. Not only do you get quicker acceleration and a higher top speed, your Rotax engine also works hand in hand with iTC to provide more precise engine calibration. What this means is better fuel economy for you. Stow your summer possessions in the standard Watertight Removable Storage Bin and save money with this watercraft’s Intelligent Throttle Control (iTC) and ECO mode function, that both help in providing improved fuel consumption. 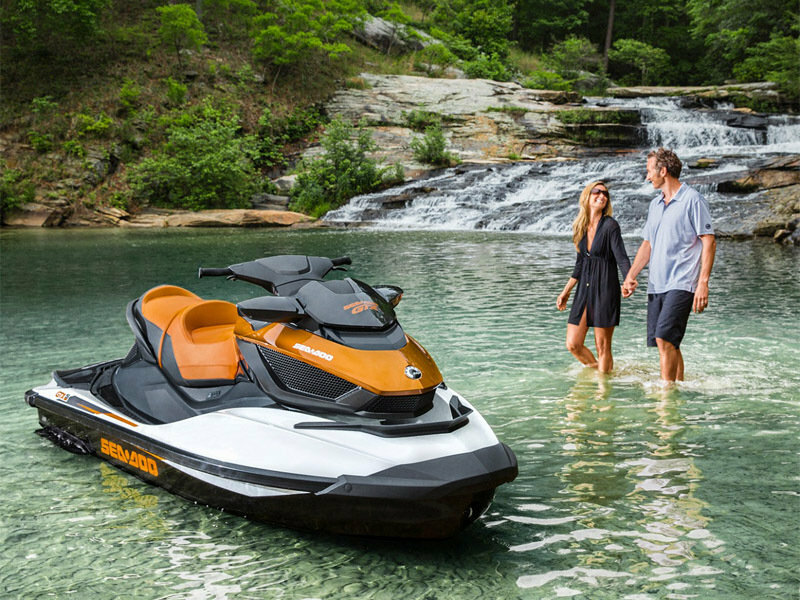 Sea-Doo is the only watercraft that starts in neutral, so the engine runs without propelling the craft forward for safer dockside starts and easy, stress-free maneuverability. And because the throttle responds to an electronic signal instead of a cable, you enjoy better fuel economy and a lower operating cost. Automatically determines the most economical power delivery for the greatest fuel economy. Removable, watertight storage for all your gear, wet or dry. Portable design gives you quick, easy access to all your essentials. This convenient storage compartment is located in the watercraft’s platform for an additional storage option. Enjoy the convenience of a touring-style hinged seat to make accessing the engine simple and hassle-free. Conveniently lifts up to provide you quick, easy engine access. The industry’s only Closed-Loop Cooling System (CLCS) that uses coolant – instead of corrosive saltwater (and even debris) that can damage the engine – to keep it running at ideal temperatures. Enjoy a more stable and predictable riding experience in any condition with our manually adjustable suspension. And thanks to our plush, ergonomic Touring Seat and Tilt Steering, you can stay comfortable longer with a riding posture that fits your personal preference. The world’s first on-water braking system, iBR lets you stop up to 100 feet sooner than any other watercraft*. All with the squeeze of a lever. And with its electronic reverse, it gives you a level of maneuverability that makes docking easier. *Based on internal testing. Based on commercially available competitive models as of August 2014. With 5.5 inches (13.97 cm) of manually adjustable suspension, you can enjoy a smooth ride in all water conditions. An activity-specific Cruise Control lets you set your speed for cruising, tow sports, navigating a no-wake zone, and more. Plush, ergonomic design provides maximum comfort and support for driver and passenger. Adjustable handlebars designed to fit your personal riding preference, so rider ergonomics work for you on the water. Now with radio frequency technology and a new ball-and-socket design, the Digitally Encoded Security System (D.E.S.S.) allows for quick starts and added security. 1,494 CC FOUR-STROKE, ROTAX WITH FOUR VALVES PER CYLINDER 1503 NA Rotax 4-TEC engine provides reliable performance in fresh or salt water, increased torque at low RPM, optimized power at all RPM levels and throttle positions. ITC™ (INTELLIGENT THROTTLE CONTROL) Operating electronically, this advanced throttle system starts you in neutral for easier dockside starts. It also features an activity-specific Cruise control, Touring / Sport mode and ECO™ mode that can all be set to accommodate your riding style. The result is a more responsive, more intuitive ride. ICONTROL® LEARNING KEY® The programmable Learning Key allows you to limit the performance of the PWC based on rider skill level. CLOSED-LOOP COOLING SYSTEM (CLCS) Uses coolant to keep the engine running at the ideal temperature, much like a car’s radiator. Also keeps out corrosive saltwater and debris. HANDLEBAR-MOUNTED START/STOP BUTTON Engine starts and stops with a single, user-friendly control button. ICONTROL The “Brain’’ that integrates and controls all systems to create the best possible ride. 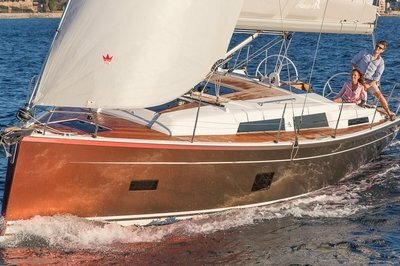 S SUSPENSION Allows the hull to move independently of the upper deck, isolating rider and passenger from the impact of rough water. 5.5". of travel with manual adjustment under the seat so rider can adjust suspension to different water conditions and total passenger weight. S³ HULL Stepped, stable, & strong. The stepped design reduces drag and keeps you glued to the water. 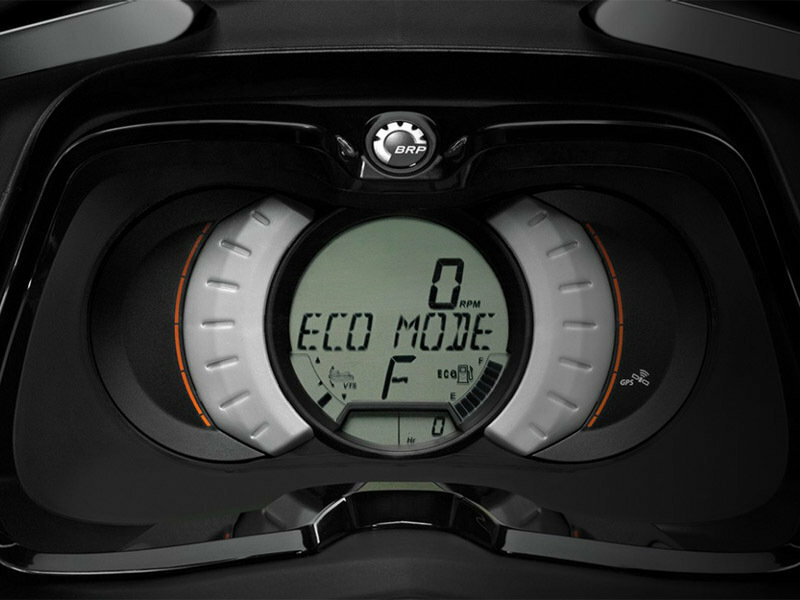 TOURING MODE / SPORT MODE Offers a choice between two throttle responses for different riding styles. Touring mode is the default setting, offering a more progressive acceleration curve for a more confident ride – ideal for cruising and 2-up riding. Sport mode can be easily activated using the Sport button. It provides all acceleration performance for a more aggressive throttle response. TOURING SEAT Ergonomically designed for comfort and great looks, providing ultra-plush seating for three. ELECTRIC VARIABLE TRIM SYSTEM (VTS™) Provides boat trim adjustments, maximizes acceleration and high-speed stability. FOOTWELL CARPETS WITH SEA-DOO LOGO PATTERN Offer extra comfort, non-skid surface, and great looks. REBOARDING PLATFORM WITH REAR STORAGE Easy access to battery, fuses, and storage. TILT STEERING Four adjustable steering angles for maximum ease and comfort. INTERACTIVE MULTIFUNCTION DIGITAL INFORMATION CENTER Reports 25 key operating functions: Fuel level, Tachometer, Speedometer, Hour meter, Compass, Clock, Fuel consumption meter, Touring / Sport mode, ECO mode, Cruise control, Slow mode, VTS, F-N-R indicator and more. RF D.E.S.S™ KEY Now with radio frequency technology and a new ball-and-socket design, the new Digitally Encoded Security System (D.E.S.S.) key provides riders with easy and quick starts every time. 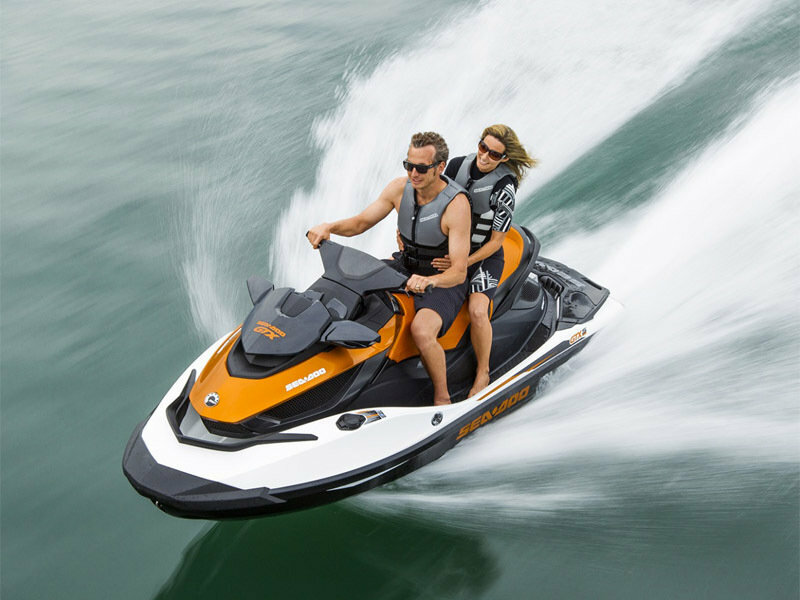 IBR (INTELLIGENT BRAKE & REVERSE) SYSTEM Sea-Doo’s exclusive on-water braking system, iBR lets you stop up to 100 feet sooner than competitive units*. All with the squeeze of a lever. And with its electronic reverse, it gives you a level of maneuverability that makes docking easier. STAINLESS STEEL IMPELLER Delivers improved acceleration, higher top speed, and less cavitation.